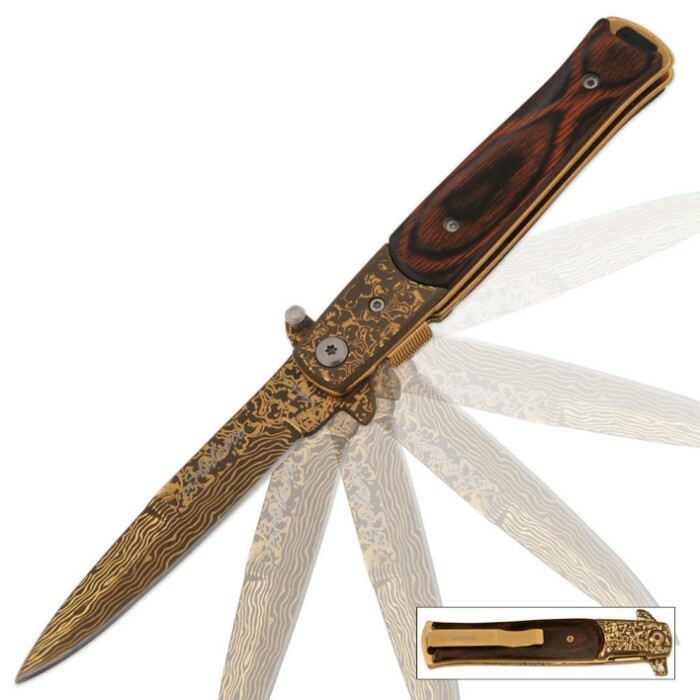 Godfather Style Stiletto Damascus Gold Folding Knife | BUDK.com - Knives & Swords At The Lowest Prices! This stiletto folder is reminiscent of the Godfather style stilettos from Italy. The 1045 surgical steel blade is razor sharp and offers an imitation Damascus pattern. The handle scales offer hardwood inserts. Includes a pocket clip. When it arrived in the mail I was once again surprised at how fast it got here. And when I opened the box. I was in awe of how nice this gold stiletto really is. The hardwood handle fits the hand very well, and the gold style Damascus blade is fast and smooth to open. Not to mention it looks awesome. I've ordered a couple more for my brothers as Christmas gifts. Not one I carry everyday but I could, a good quality blade for the 7.50 price (with sale discount). Sharp and nicely styled. I always take every screw out and put thread locker them or at very least check them for tightness and oil the pivot. This one is kind of unique, something for show. Nice wood handles. I like the "Stilletto" script on the blade and pocket clip, hard to see in the picture. That's Italian. This was is a Awesome stiletto...until it broke What happened was the blade was loose in the handle and the catch and release mechanism popped into the wide gap produced by the looseness of the blade inside the handle. I then tried a little DIY on the knife and it didn't work. So I emailed BUDK about it and they sent me a FREE brand new replacement stiletto knife that is still working fine and it is Awesome. So if my first stiletto (that had broke) had come without any problems I would have given this awesome stiletto the a five star review that it deserves. Very good knife, came very sharp, solid wood handle, tight fittings, tight lock, smooth opening. All well put together smooth and elegant definitely would say buy this!